What’s this? An Arnold Schwarzenegger zombie movie, you say? Well it’s about damn time the greatest action star the world has ever known picked up his gun and blasted through swarms of the undead, equipped with bullets, one-liners and enough macho bravado to turn a teen girl sleepover into a beer and arm wrestling contest. Unfortunately, Maggie isn’t such a zombie movie. 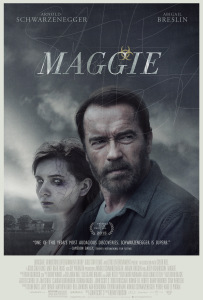 In fact, Maggie isn’t like any zombie movie that’s ever been made before until now. The Walking Dead might have popularized the trend of a zombie apocalypse around human drama, but not until Maggie has it ever felt so human. It’s a change of pace for Arnie, and it’s bound to make for the most surprising turn of the year. Wade (Arnie) commands respect from the community; it’s a small town where everybody knows everybody; police and doctors treat Wade with respect due to their long storied history together. History, although never mentioned, would suggest that Wade is a good man who’s well liked, which is why he’s allowed to take care of Maggie (Abigail Breslin) until she’s about to turn. However, when the time comes he’s faced with 2 choices: send her to quarantine, or take care of it himself. But like any loving father would, he refuses to give up on her. Maggie uses the the zombie transformation as a framework for a family facing loss from terminal illness and a fathers failure to come to terms with it: from the outset we know Maggie is doomed to face the inevitable; there is no hope on the horizon or a cure being discovered. Tragedy is inevitable and all we can do is watch as everything begins to shatter. As good as Arnie is in his role, it’s Abigail Breslin who stands out as a teenage girl seeing out her final days; her relationship with her father is natural, sweet and one of the reasons her situation is hard hitting – but that also extends to the relationship she has with her friends she must bid farewell to. Maggie boasts stunningly dreary cinematography; the Midwestern backdrop is always cloudy and grey, setting a mood throughout that’s always one of sadness; sometimes there’s moments of beauty within the sadness and the setting, the score and atmosphere are poignantly fitting to the descent into heartbreak we have to endure. Arnie’s speaking parts are limited; his emotions are conveyed through his expressions and actions; these range from walking through the fields as the suns starts to set and staring aimlessly into bonfires at night. He spends his moments away from caring for Maggie alone – struggling and contemplating – and it’s all evident on his withered facial expressions. It’s a somber performance; undoubtedly this is the best he’s ever acted in his career, even if it’s not his best movie as a whole. The horror in Maggie is lacking, but not non-existant; there are one or 2 scenes that provide some tension, but if you go into it expecting a horror film you might be disappointed. It’s an indie drama about family and loss – but it’s one of the freshest takes on the zombie sub-genre in recent memory, and certainly one of the best. Maggie is a change of pace for an iconic actor we’ve grown to know and love for being typecast; it’s a change of pace for a horror film because it’s lacking in traditional scares – although the fear of losing someone you love is scarier than any monster. If you’re prepared to go in with an open mind then you might just find yourself captivated by a beautiful, tragic story that reminds us what it really means to be human. 8/10.